Wes Scott Cycles is carrying on the fine tradition of servicing and restoring British bikes for customers in Florida and across the United States. 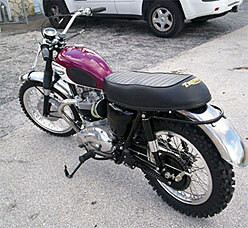 Wes Scott Cycles also has one of the largest stocks of Triumph, Norton and BSA parts in Florida. Over 20 years ago, we acquired the entire stock of new and used parts of Broward Motorsport, which doubled our inventory base. We have nearly every part for most Triumphs, BSAs and Norton Commandos that anyone would ever need! To find out more please browse our site! See photos of this fully restored Triumph T120TT Motorcycle and other bikes we have worked on in our British Motorcycle Restorations photo gallery. Copyright © 2009, Wes Scott Cycles Inc.